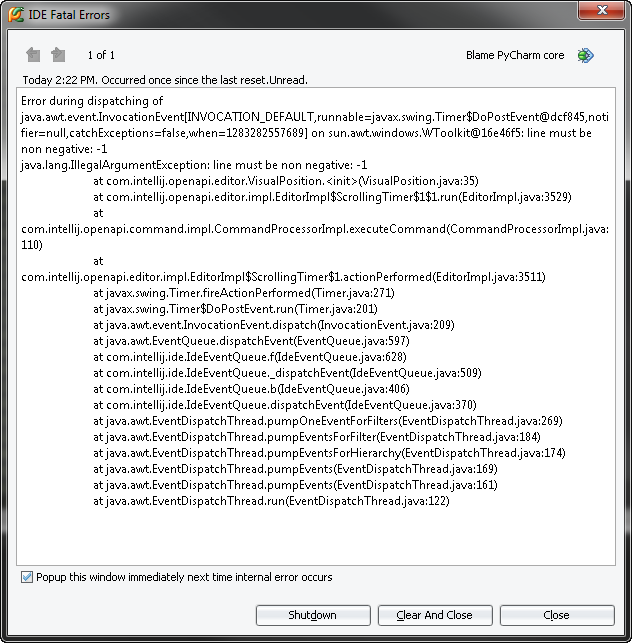 Earlier today I got a IDE Fatal Error that said "Blame PyCharm Core". The pop-up error window did not allow me to grab the text of the stack trace, although I was able to grab a screen capture (see attached). Uncertain if it helps, but I was running PyCharm 1.0 Beta 2 which I've had open yesterday morning. I had just created a new Python file and pasted a list (about 70 items) into the newly opened file in the editor, then clicked at the bottom of the list and was dragging my cursor upwards (fast and jaggedly --- bad habit I learned in Excel when scrolling up or down) to select/high-lighted about 2/3 of the list to ident them. Before I released the mouse button,that was when I received the IDE Fatal Error message. FWIW, I closed PyCharm and relaunched --- and everything seems fine now. I created a ticket - IDEA-58244, feel free to track its progress.